CIVIC authorities in Kanpur never seem to find the time or the resources to solve the problems of the 3,000 residents of Rajapurva, a slum in the heart of the city. This must be so, otherwise how can one explain why a slum settlement that's older than the nation was never provided with basic amenities such as drinking water, latrines, alleys, electricity and medical care. Rajapurva's residents, mostly construction workers, stall operators and class three and class four employees, are not destitute. But they still cannot afford to live in localities with better basic facilities. However, a change is taking place ever since Shramik Bharati (SB), a non-governmental organisation led by Ganesh Pandey, began to work in Rajapurva early last year. SB's objective is to help Rajapurva's residents to help themselves. "The residents told us that their biggest problem was lack of toilets," said Pandey. "We were shocked to hear that some people had grown up in Rajapurva without a toilet." Women, in particular, were extremely inconvenienced because there was no place they could use during the day to ease themselves. "Many of them used 4matkas ( 5earthen pots) for urinating and defecating and these would be kept in the house until sunset," said Pandey. "It was hell for the aged and the ill." No wonder then that for almost everyone in Rajapurva community toilets topped the priority list. SB helped the residents to form a committee of mostly women, who launched a voluntary fund drive in the slum. Almost every resident contributed from their meagre earnings and the committee opened a savings account. When the account reached Rs 50,000, the committee applied to the government under a scheme to construct community toilets for the urban poor who need pay only 10 per cent of the cost. Construction of 50 community toilets in Rajapurva was estimated to cost about Rs 10 lakh and the slum residents made a payment of Rs 50,000 on December 16, 1991, to the Kanpur municipality as the first installment. On March 8, 1992, state urban development minister Premlata Katiyar laid the foundation stone of the project. "A very big gain from this endeavour," explained Pandey, "has been that people have gained confidence and are aware now that many of their problems can be solved through community endeavour." After the toilet experience, SB had little trouble enlisting public cooperation in Rajapurva for its next project -- reviving a government school in the slum that had ceased to function years earlier and whose premises had become a garbage dump and a gathering place for pigs. SB members and Rajapurva residents organised a cleanup-drive and repaired the school building. Then they obtained teachers and classroom equipment and the school was reopened. 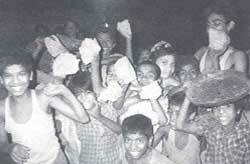 SB has undertaken several other projects in the slum, including arranging for ration cards, installing a 6,000-litre water tank and setting up a committee of elders to mediate community disputes so as to avoid the expense of going to court. Some Rajapurva residents formed four boond bachat sangathans (thrift groups), with a total membership of 101, including 58 women. Members make regular deposits and loans are made at nominal interest to help set up small businesses, such as a pan-supari kiosk or a handcart. The thrift groups, however, has not had smooth sailing all along and Pandey explained why. "We want the savings to be invested productively," he said, "and so when someone is refused a loan, they get annoyed." Pandey said an even more serious problem is ensuring loans are repaid. Some borrowers tried candle-making and supplying lunch to nearby factory-workers, but both projects failed to earn surpluses for the loans to be repaid. "Now, we are trying to get purchase orders for things like candles from the government, but paying the required bribes is deterring us," complained Jayant, an SB activist. But, undaunted by these problems, SB has expanded its activities to four other Kanpur localities, with reopening schools getting first priority. "There are about 200 dead schools in these areas," explained Pandey. "We plan to restore at least 25 of them in the first year."